Please be sure to review the information on the Facebook Posts , Campaigns and Website components of the Growth Engine before continuing to review this article on the Email component. Countless people visit your website and attend visitations or services on an annual basis. How do you continue to keep in touch with each of these community members after the service is over? Quite often, there is little or no communication due to lack of time and resources. The Growth Engine is designed to help you effortlessly provide valuable information and outreach to each of their inboxes. This continual outreach is done through monthly newsletters and an email series. If you check your email inbox, you will see monthly newsletters from many of the brands you know and trust. Newsletters are informational, educational and capture your attention. But one thing is often left out– a strong sales message. This is by design. People tend to make purchasing decisions through education and email newsletters. They are a great way for your business to keep in front of your community by providing ongoing education and support long after the service is over. Below is an example of one of our email newsletters. Each newsletter is sent out from your email address and comes to you if they respond. The community member doesn’t know Funeral Innovations exist (and that’s how we like it). 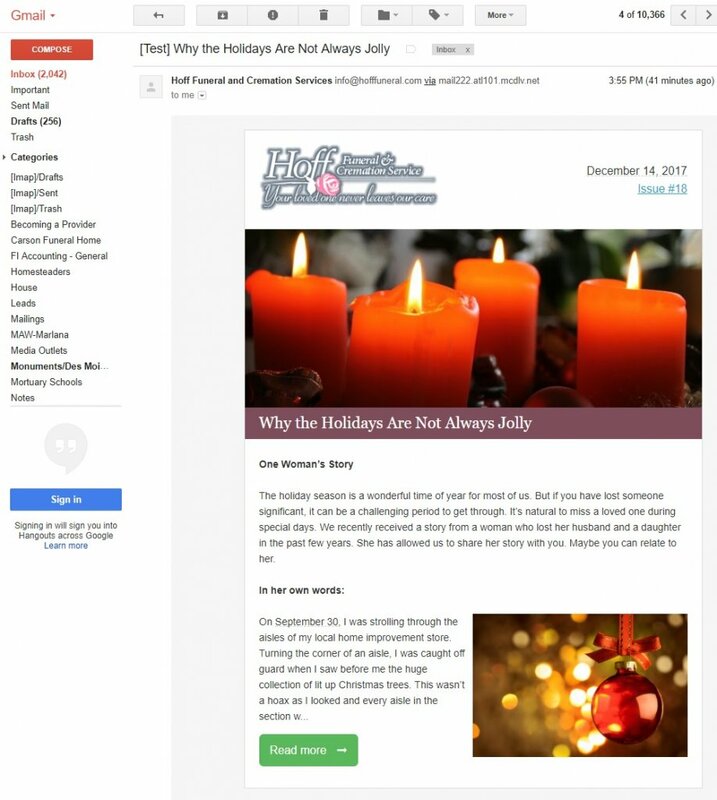 This newsletter is focused on the holidays and why they are not always jolly. It is a grief related email targeted towards those who have lost, or know of someone who has lost, a loved one near the holidays. In less than five minutes, you can select a newsletter topic from our library and personalize it as much (or as little) as you wish. Once finished, publish it to your subscriber list or schedule it to be sent at a later time and date. An email series differs from a newsletter in the sense it is a more targeted message. Many of the Campaigns within the Growth Engine use an email series to continue outreach after their contact information is provided. 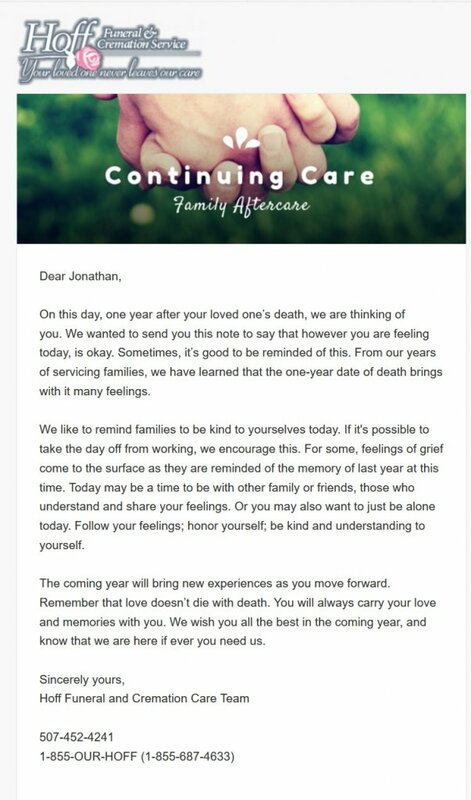 Along with Campaigns, we use email series to subscribe family members in aftercare and grief outreach. Below is an example of an email from our Continuing Care series. This is an email series your staff enters family member information into for ongoing outreach after the service is over. In less than a minute, you can enter their information to connect with family members for the first year following the death of their loved one. The example above is sent on the one year anniversary of their passing. There are also emails sent for Thanksgiving, a 6 month check-in and other significant days. Your staff doesn’t need to craft the email or remember to send the emails on the appropriate days. The Growth Engine will automatically send the emails out on the right day based on the obituary information.